The Digital Storytelling app has been selected in the jury's shortlist for the History Online Award. The History Online Award honors the best historical website or app in the Netherlands. The winner will be announced on Thursday, February 12th at the Royal Library in The Hague, The Netherlands. The Digital Storytelling app is an initiative of the Liberation Route Europe Foundation. Dutch advertising and digital agency One Shoe developed the unique historical app. 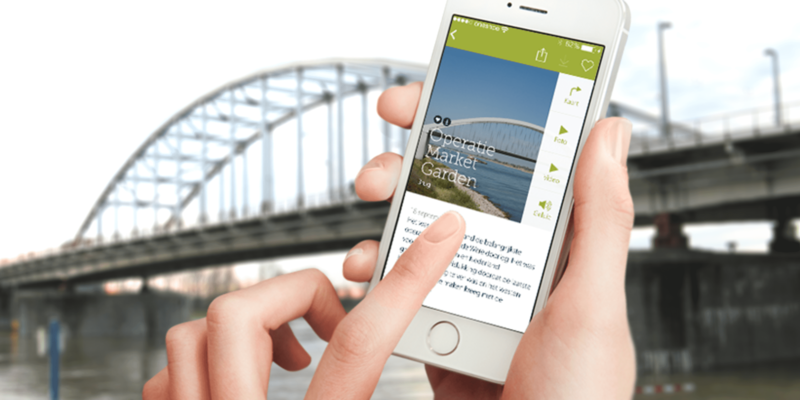 The Liberation Route Europe app gives you direct access to the storylines, places of interest, historical events and biographies: everything on the website including historical photographs, audio stories and videos. The app uses GPS technology to give its users information about the happenings on the road to a free Europe, based on “spots” (GPS locations). If you need to know the exact location of an historical event or a museum, you can take a look at the map and use the navigation function to take you to where you want to go. This way, visitors literally follow the liberators’, or even the oppressors’, steps. This is because the app’s content and the website aim to show each story from both sides. Liberation Route Europe is available for Android and iPhone.